NOTICE: This item is a firearm and must be shipped to an FFL dealer in your state. Please visit our FFL Information page for details and help with the process. 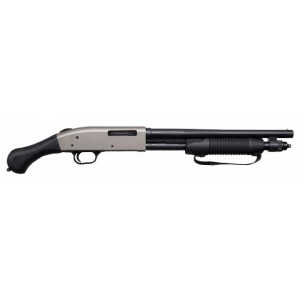 This 410 bore offers legendary Mossberg pump-action reliability in a compact 14" barreled package. The Shockwave Raptor bird's head pistol grip is uniquely shaped to minimize felt recoil. Includes all the features that have made Mossberg pump-actions the choice for millions worldwide: ambidextrous safety, dual extractors, positive steel-to-steel lockup, twin action bars, and a smooth operating anti-jam elevator. The Bureau of Alcohol, Tobacco, Firearms & Explosives has confirmed the 590 Shockwave as a "firearm" per the Gun Control Act (GCA), but not a Class 3/NFA firearm. Click here to read a copy of the letter from the BATFE regarding federal classification of the Shockwave, dated 3/2/2017). NOTE: This letter only speaks to its FEDERAL status. There could be local/state laws that prohibit the sale of this gun in your state. Consult your State Police for clarification. Just as with any other pistol grip firearm, the buyer must be 21 years of age, and be a resident of the state where s/he is purchasing it.